It is now possible for hackers to remotely access the webcam on your computer or the camera on your cell phone or tablet and watch you discreetly! This means depending on where you keep your computer, laptop or phone, hackers can watch you inside your home practically any time they want. And according to a Fox News story, the FBI also has the ability to hijack your computer or phone’s camera without you ever knowing it! And you won’t need any technical skills to use it! In this special bundle, you’ll get a 5-pack of these powerful spy blockers. Our unique solution for protecting your privacy from hackers, sexual predators and even government agencies is very easy to implement. On each card, you get SIX reusable “adhesive free” and moveable vinyl screen blockers that are guaranteed to work on any device you own! You simply stick them on your computer webcam, phone camera or tablet camera and intruders won’t be able to see a darn thing! Then YOU are at risk of being spied on by hackers, sexual predators and even the government! 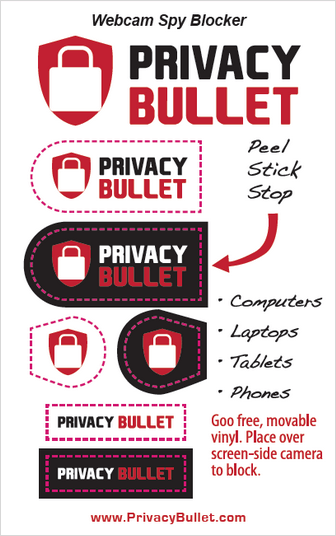 The Privacy Bullet Webcam Spy Blocker is the only solution that offers 100% piece of mind no matter the device you use to access the Internet!